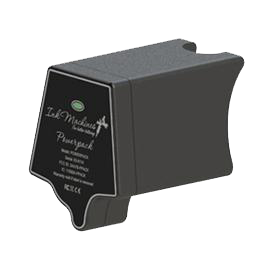 These Powerpacks are made with leading edge battery technology weighing only 65 grams designed not to interfere with the hand more than the machine normally does. Leading edge battery technology weighing only 65 grams designed not to interfere with the hand more than the machine normally does. Once the machines are rigged with Powerpacks the main unit will sense which machine is picked up and recall the settings for that machine. High capacity batteries allows aprox 5 hours of effective running time and charging takes about one hour. Communications between the units are by radio for optimal reliability and performance. To make the system complete we incorporated functions like Kickstart and Boost mode. Kick start allows the machines to start easy and run at low voltage. Boost mode actively controls the voltage to maintain the same speed during various loads and increases the machine power significantly. Powerpacks for Dragonfly and Stingray are only compatible with the TPS-500 with matching charger bay and RPS-600 main unit and can not be used without the main unit.